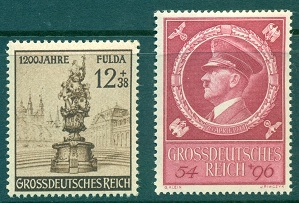 The Third Reich issued the stamp shown above, at the left (Mi. #864, Sc. #B251), on January 25, 1944 for the Centenary of the Birth of Dr. Robert Koch. Dr. Robert Heinrich Herman Koch (1843-1910), a German microbiologist, became famous for isolating the anthrax virus and the tuberculosis virus during the 1880's. He was awarded the Nobel Prize in Medicine, for his tuberculosis findings, in 1905. Dr. Koch is considered one of the founders of modern microbiology. The stamp shown above, at the right (Mi. #865, Sc. #B252), was issued on January 29, 1944 to commemorate the 11th Anniversary of the Assumption of Power by the Nazis. 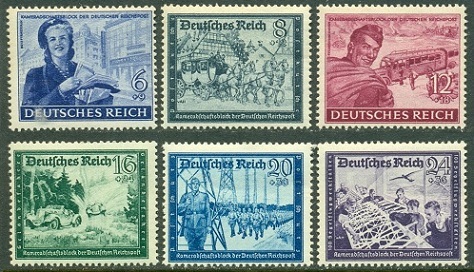 The stamp design features the Third Reich emblem, flag, and Adolph Hitler. The three stamps shown above (Mi. #866-68, Sc. #B252A-52C) were issued on February 11, 1944 to commemorate the 25th Anniversary of the German Airmail Service. The three stamps feature a Focke-Wulf Condor FW-200 in flight, a Blohm & Voss seaplane and the Lufthansa emblem, and a profile view of a Junkers JU-90 and the Lufthansa emblem. The four stamps shown above (Mi. #869-72, Sc. #B253-56) were issued on March 2, 1944 to commemorate the 10th Anniversary of Mother and Child Aid. The stamps depict an infant's crib, a public nurse, Mother and Child clinic, and expectant mothers. The thirteen stamps shown above (Mi. #873-85, Sc. #B257-69) were issued in the Third Reich on March 21, 1944 to celebrate Army Day. 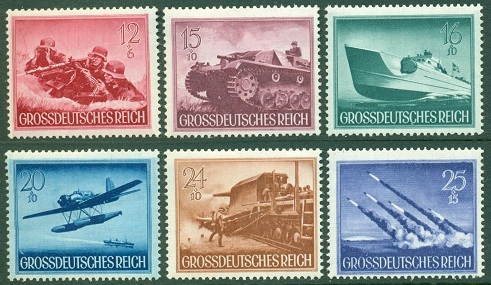 The stamps from the lowest to the highest denomination feature an assault boat, a chain-wheel vehicle, paratroops, a submarine officer, grenade throwers, a searchlight, infantry, a self-propelled gun, a speed boat, a sea raider, railway artillery, rockets, and a mountain trooper. The stamp shown above, at the left (Mi. #886, Sc. #B270), was issued on March 11, 1944 to commemorate the 1,200th Anniversary of the Town of Fulda. The stamp depicts a Flora Statue in Fulda's Schloss Garden. The stamp shown above, at the right (Mi. #887, Sc. #B271), was issued on April 14, 1944 to celebrate the 55th Birthday of Adolph Hitler. The six stamps shown above (Mi. #888-93, Sc. 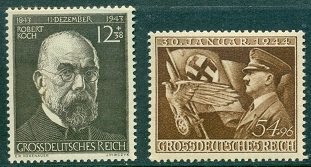 #B272-77), issued in May 1944, are very similar to the 1939-1941 Camaraderie of German Postal Workers Issue, but these stamps are a smaller size, and the designs are different. From the lowest to the highest denomination, they feature a woman mail carrier, a mail coach, field post in the east, an automobile race, postal police, and glider workshops. The two stamps shown above, at the left (Mi. #894-895, Sc. #B281-82), were issued in June 1944 to honor the Reich Labor Service (RAD). 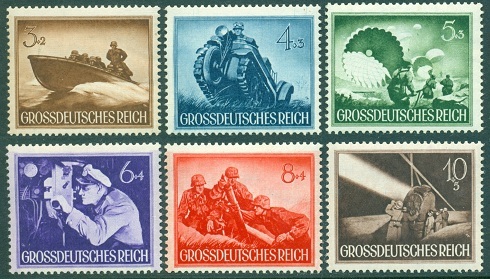 The two stamps depict labor corpsmen of the Third Reich. The stamp shown above, at the right (Mi. #896, Sc. #B280), was issued on July 2, 1944 to celebrate the 400th Anniversary of Albert University in Königsberg. The stamp pictures Albert I (1490-1568), Duke of Prussia. The two stamps shown above, at the left (Mi. #897-98, Sc. #B278-79), were issued July 7, 1944 to publicize the 7th National Shooting Matches at Innsbruck. The stamps depict a soldier and a Tirolean Rifleman. The stamp shown above, at the right (Mi. #899, Sc. #B283), was issued on July 23, 1944 to publicize the 11th running of the Brown Ribbon Race in Munich-Reim. The design features a race horse and a foal. The two stamps shown above, at the left (Mi. #900-01, Sc. #B284-85), were issued in August 1944 for The Grand Prize of the Freudenau. The design features the head of a race horse in an oak wreath. The stamp shown above, at the right (Mi. #906, Sc. #B289), was issued on November 9, 1944 to commemorate the 21st Anniversary of the Munich Beer Hall Putsch. The stamp depicts an eagle attacking a serpent. The two stamps shown above, at the left (Mi. #902-03, Sc. #B286-87), were issued on September 11, 1944 to honor the German Goldsmiths' Society. The stamps depict the gold Nautilus Cup in the Green Vault in Dresden. This stamp exists imperforate, with a value of about $175.00. The stamp shown above, at the right (Mi. #904, Sc. #B288), was issued on October 2, 1944 to celebrate Stamp Day. The stamp depicts a post horn and letter. The 6 Pf. + 4 Pf. 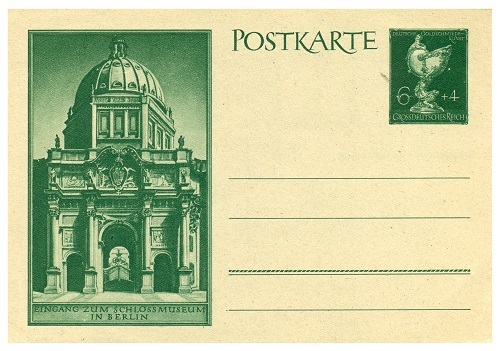 postal card shown above was the companion issue to the German Goldsmiths' Society set of stamps. The left side of the card depicts the entrance to the Palace Museum in Berlin. This was the last commemorative postal card to be issued by the Third Reich. Remember that the lots on European eBay sites are priced in EUROS. Shipping charges may be more, and the lots may take longer to arrive. Also, make sure the foreign seller ships to your country, before bidding on or buying his lot.